HOW ARE THE PAINTINGS FRAMED? My larger pieces are all framed in a solid wood, handmade, hand gold-leafed frame with lovely bits of Chinese red undertones. These are the real deal. (Note: the color of the gold frame may be a bit darker on you computer or mobile device screen.) 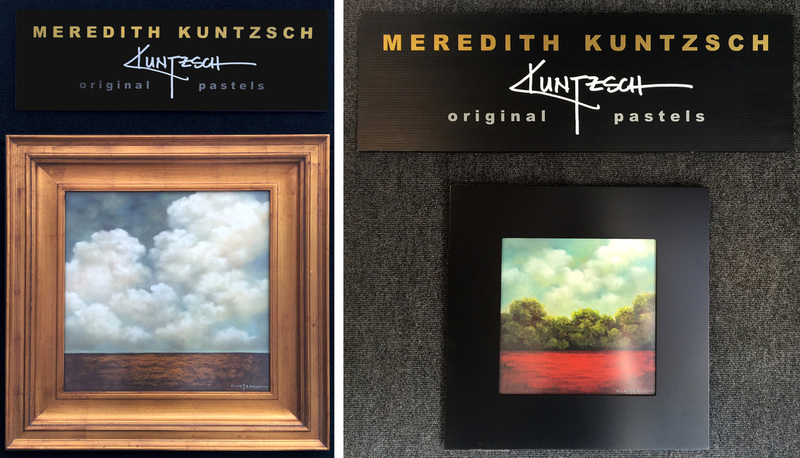 All materials used in framing the pieces are the highest quality, heavy stock, acid-free, materials and framed behind a UV protected, acid-free non-reflective conservation glass made especially for fine art framing. This is the expensive stuff, NOT the acid etched hardware store "non glare." Beware of that stuff! My smaller black-framed pieces are framed with a low profile, black contemporary frame. These paintings are also created on specialty pastel paper and framed behind conservation glass. Shipping is available throughout the 48 contiguous United States. Paintings are shipped exactly the way in which they are exhibited at a show and described in the paragraph above regarding FRAMING. Paintings are carefully packaged, insured and delivered to the address of your choice whether your home or office or even your neighbors if you trust them not to keep your beautiful new painting. We all love art. Because of the consistency of pastels, they cannot be shipped without the glass and are not recommended to be hung without it either. Doing so may result in damage to the painting itself as the dry pigment will smear with any light touch to the surface. Please refer to the link about pastels. **UPS POLICY - In the unlikely event UPS walks elephants over the box and damage is obvious from the outside, PLEASE make certain to take PHOTOGRAPHS of the damage on the outer box AND the painting itself for processing the claim. Also be sure to RETAIN ALL SHIPPING MATERIALS and contact me immediately via email or text (734.674.7542) with these photographs. At this time a claim will be filed with UPS and they will most likely come to pick up the painting and all the materials for proof of damage for their claim adjusters. In the near two decades I've been shipping artwork, this has only occurred once. So don't fret! If you have any questions, please don't hesitate to contact me. Visit the link artwork to see a sampling of what's available. Since I'm on the road much of the time, newer works may not yet be posted online. Therefore, many of you like to visit me at shows and chose your piece in person. Whether or not you go this route or if you purchase online, there are many options and information about purchasing that I've discussed below. Shipping is available whether you buy in person or online. Please see the section below regarding SHIPPING procedures. WHERE CAN I FIND YOU AT A SHOW? If you are interested in finding me at a show near you, click on contact/subscribe and I will send out the occasional, brief mailing with my show schedule update. At a show you can see all the paintings I currently have available and you and I even get the chance to talk our heads' off about technique, inspiration and life in general. I love meeting you! I sure do! Lots of them. Here's how we do it. First take a look at the paintings currently available at a show or even those available or archived online. Then let's chat about which images you love from the website and what size you are looking for. We can discuss your interests, your space, your options, and go from there. I happy to help you get a beautiful painting created just for you! OOPS, WHAT IF I DECIDE I'D RATHER HAVE A DIFFERENT PAINTING THAN THE ONE I PURCHASED? Now, if for whatever odd reason you’re not enamored with the artwork you ordered, let me know. Sometimes customers find that the piece just isn't large enough for their space. No worries! You’re an art lover, I'm an art lover, and we’re both reasonable people. Simply ship it back to me properly packaged (you can even use the original shipping materials), insured to the full purchase price and send me a text or email with the tracking number. If it arrives in fine shape, I’ll be happy to help you find another one for an exchange. Sorry no refunds, but we should all live with art that we love unconditionally, yes? So it's my pleasure to work with you again on finding the piece that works perfectly for you. WHAT KINDS OF PAYMENT METHODS DO YOU TAKE? If you find the piece you're looking for online, you can easily purchase via the secure shopping cart in my online store. The merchant service is PayPal and you are able to pay directly using your own PayPal account or any credit card you prefer. You can even send a money order, cashier's check and even the almighty green stuff. Once payment has been made, off goes your painting towards it's new home! If you are at a show, the same payment options apply except there we will simply swipe the credit card of your choice. When purchasing online, the piece will be shipped to you ASAP depending on my travel schedule. This is usually within 5 days. See the above section on SHIPPING for more information.